My study of the Indus Civilization has brought to light a body of excellent literature on various aspects of this ancient urban complex which has not been incorporated into three or four standard sources frequently cited in secondary literature. Most of his supplementary material is in journals and other periodicals, often difficult to locate even in the best libraries. Yet, it constitutes an essential source for a comprehensive study of this civilization. To bring some of this literature together within a single volume was a major motivation behind the preparation of this book. An attempt to correct a certain imbalance in our understanding of this civilization is of equal importance. 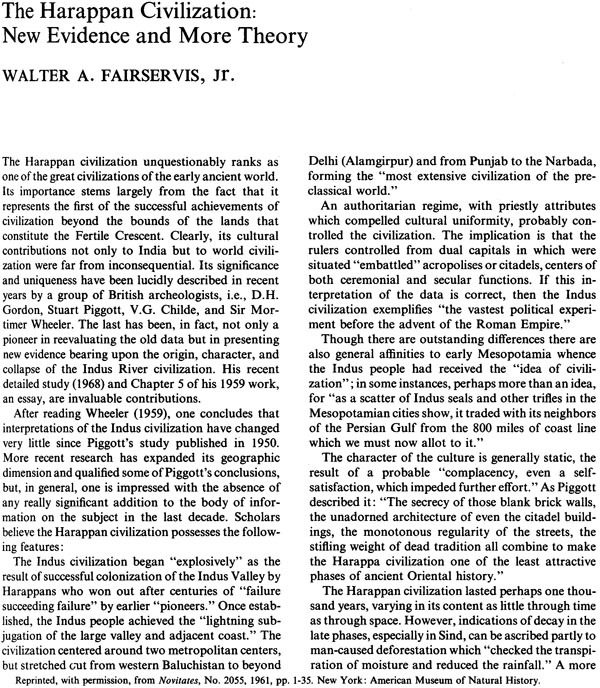 Too often it has been the standard source, especially Sir Mortimer Wheeler's The Indus Civilization (1968), to which scholars have turned for information and interpretation. There is no doubt about the excellence of Wheeler's book, but it is still largely a reflection of his perspective. In a sense, then, Ancient Cities of the Indus was compiled in an effort to introduce a range of opinion and interpretation of issues too often considered settled. 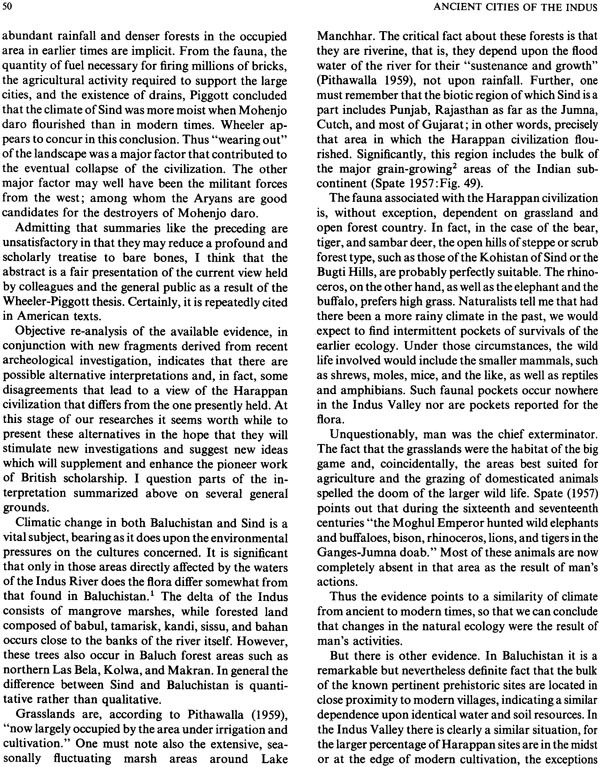 The reader will sense in many of the papers, which follow this introduction, a search for paradigm rather those who study the Indus Civilization. This can be attributed to several factors. 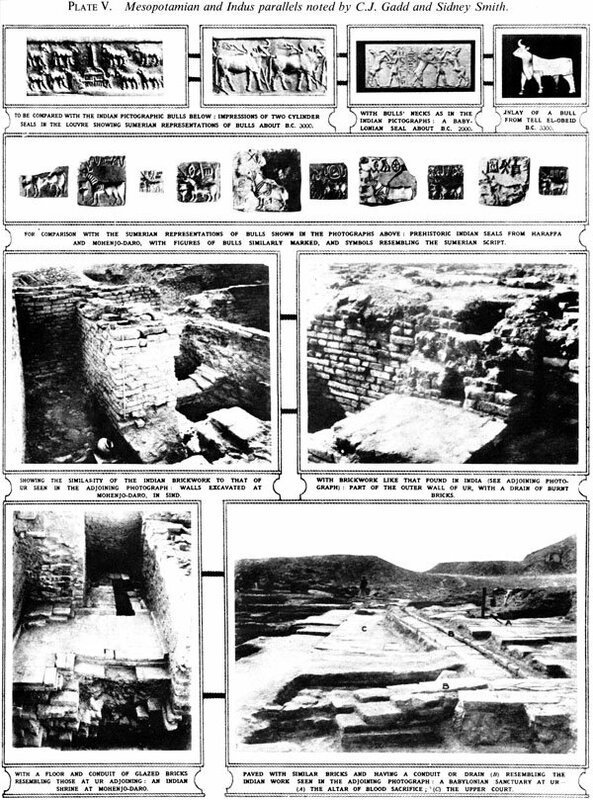 First, the synthesis of the field data gathered in the twenties and thirties at Mahenjo daro, Harappa and Chanhu daro was largely complete by the end of the fifties through the efforts of Sir John Marshall, E.J.H. Mackay, Sir Mortimer Wheeler and Stuart Piggott. Many of their interpretations have now been challenged by others. For example, both the widely referenced hypothesis concerning the Aryan destruction of the cities and the notion of twin capitals ruling a vast empire have been largely laid to rest by more recent scholarship. These critiques have not, however, replaced the earlier interpretations with fully viable alternatives. It must also be considered that, with the creation of Pakistan in 1947, there was renewed excavation in the Indus Valley at the important sites of Kot Diji and Amri. On the Indian side Kalibangan, Lothal and Rangpur were excavated during this period. Much new and extraordinarily important material has come to light in the course of these excavations and it deserves consideration as well. Several papers in this volume deal with Kalibangan and Lothal. For coverage of Kot Diji and Amri the comprehensive site reports should be consulted (F.A. Khan 1965 and Casal 1964a). As new and important as this material seems to be, there is still a challenge for those who study this civilization. There is, for example, little in the way of knowledge concerning the specific institutional configurations of the Indus Civilization. Based on the presence of granaries at both Mohenjo daro and Harrappa, Sir Mortimer Wheeler (1966:18) has suggested a redistributive on the Mesopotamian model. Thois inference has been challenged by Marcia Fentress (1976). But it has not been replaced by an alternative which provides an insight into the nature of Harappn economic organization. It is evident to many who have evaluated the quality of the data from the major excavations which opened this civilization to the world (Marshall 931; Mackay 1938; and Vats 1940) that they offer very little guidance in clarifying this problem. This suggests that renewed excavation is called for, with more clearly defined objectives incorporating elements of hypothesis testing. The apparent absence of Harappan economic documents will certainly make penetrating insights into this institution a difficult one. But structures which functioned as granaries, workshops and warehouses can be projected as archaeological features which will emerge through appropriately sensitized excavation and analysis. It is also possible for renewed excavation to more comprehensively recover and analysis. It is also possible for renewed excavation to more comprehensively recover and record not only new and potentially important kind of data, especially organic materials, but to handle the traditional range of artifactual data and their associations more rigorously. It is reasonable to expect that such procedures on newly excavated sites would yield interesting results concerning economic organization and processes. The association between settlement and natural resources it also an area which more intensive investigation. Work on Indus settlement patterns in Gujarat (Possehl 1976) has indicated that the site of Lothal was a frontier settlement which played a key role in the Harappan economy at an interregional level. Given the fact that there are other outing sites, similar to Lothal, distantly removed from the great urban centers, there is a possibility that similar implications for economic processes are to be gleaned from an investigation of these places as well. More specifically, settlements, such as Sutkagen dor on the Iranian border, Rupar to the north near foothills of the Himalayas, and Dabar Kot in Baluchistan could be noted as potential places to begin such as study. Settlement archaeology also has much to offer toward solutions of other problems. 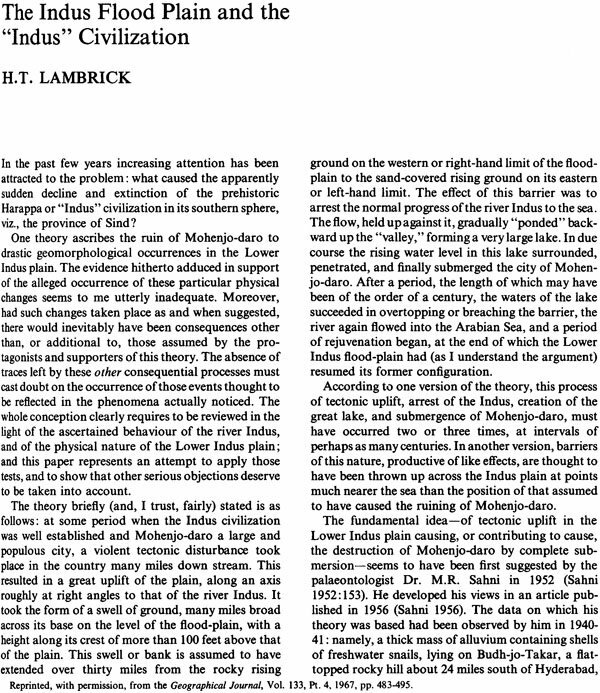 There are, for example, still many lacunae in our understanding of the Indus subsitence sytem. Even the question as to whether or not the Harappan inhabitants of Sind and the Punjab used large-scale canal irrigation has yet to be conclusively answered. 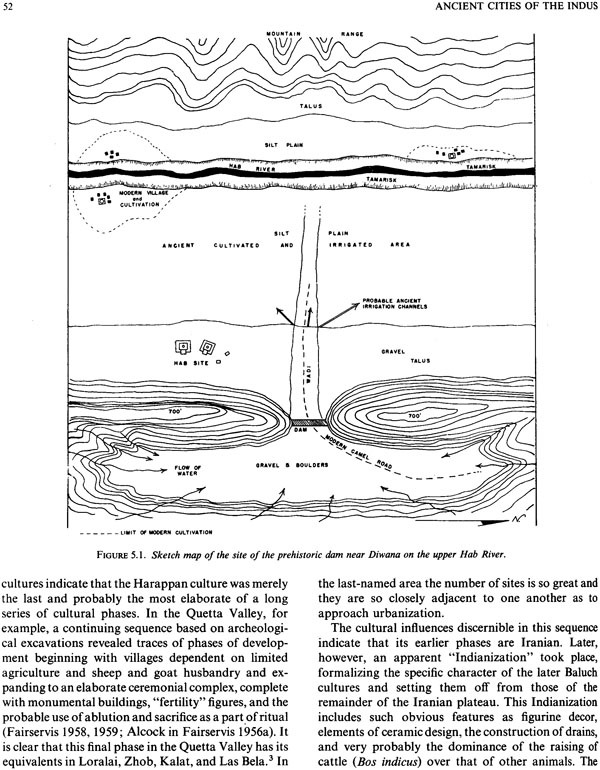 Assuming the success of settlement archaeology in solving this problem in Mesopotamia (Jacobson and Adams 1958; Adams 1965; Adams and Nissen 1972) systematic exploration should be conducted in Pakistan, and India also, with this as a research objective. Settlement archaeology is probably the soundest approach to insights concerning the almost totally undefined Indus state. While it is true that settlement patterns cannot be reasonably expected yield direct insights into the institutional heart of the political system, there are some dividends which can be anticipated. A much closer control over the settlement hierarchy, only fragmentarily perceived today, would seem to be a positive step in this direction. There is a range of analytical techniques derived from locational geography which could be used here as well. These could be employed to suggest to both significant aspects of settlement function, and potential internal borders as well. The full explication of the Harappan political institution will undoubtedly be an extraordinarily difficult problem in the absence of substantial written documents. It may be recalled that by far the largest corpus of Indus writing is engraved on square steatite stamp seals. The message length inscriptions is, on the average, between five and six signs. The general Character of these seals leaders us to assume that they were closely tied, probably in some complex way, to the identity of their original owner. 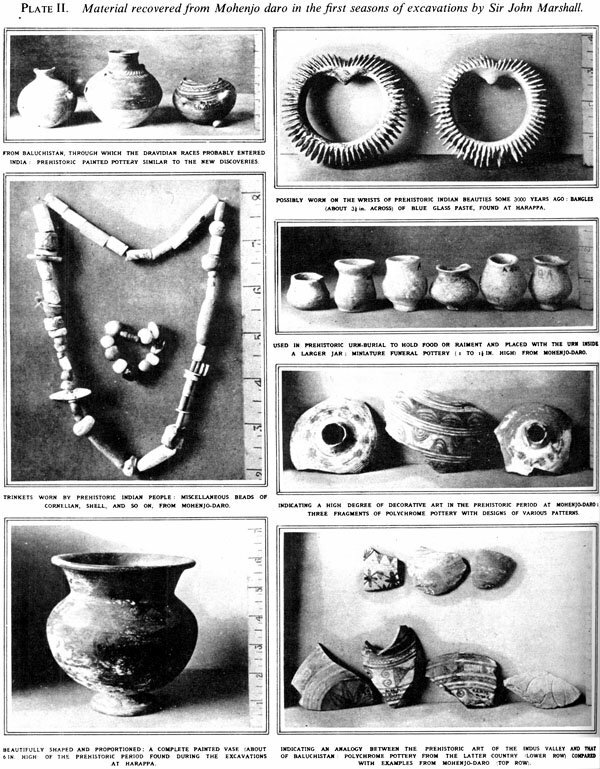 Distribution analysis of these objects within Mohenjodaro, the only site with a sufficient body of adequately documented examples, has not produced coherent patterns (Fentress 1976). But a sign association study by WalterFairservis (1976 : 110-111) suggests that the message content may be a system of rank and title. This is still a preliminary conclusion, and is now no more than a promising direction for future research; however, the discovery of an Indus system of rank and title would have obvious implications for both political and social organization. With the exception of obsolete concepts such as "priest-kings" there is little to be said of the structure of Harappan society. 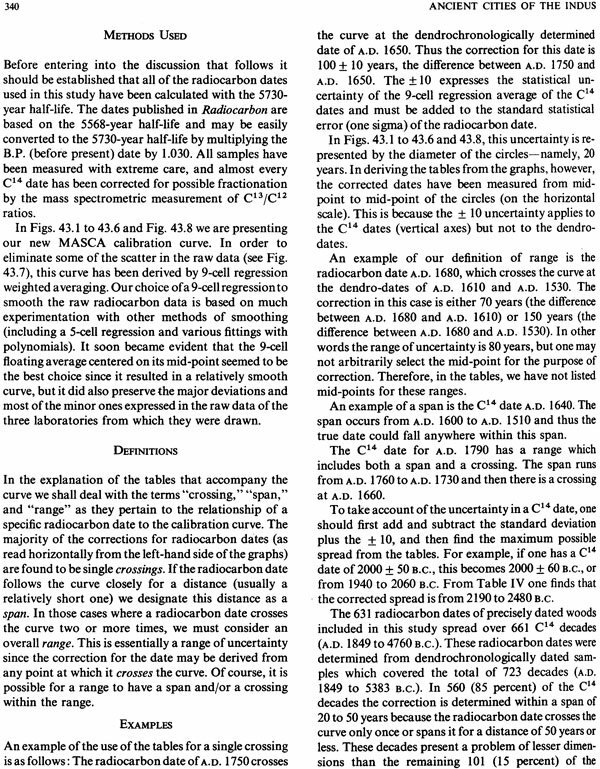 The inference from the seals is undoubtedly the most promising approach to this problem to emerge from recent research. Of course, burial data can and have been to make inferences concerning pre-historic social systems. 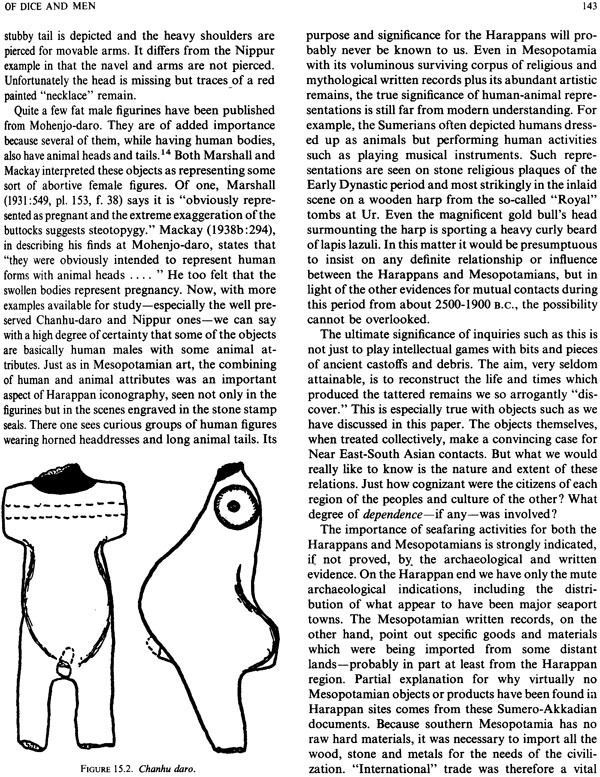 The application of such an approach to Harappan materials is discussed in the Introduction to Part I. 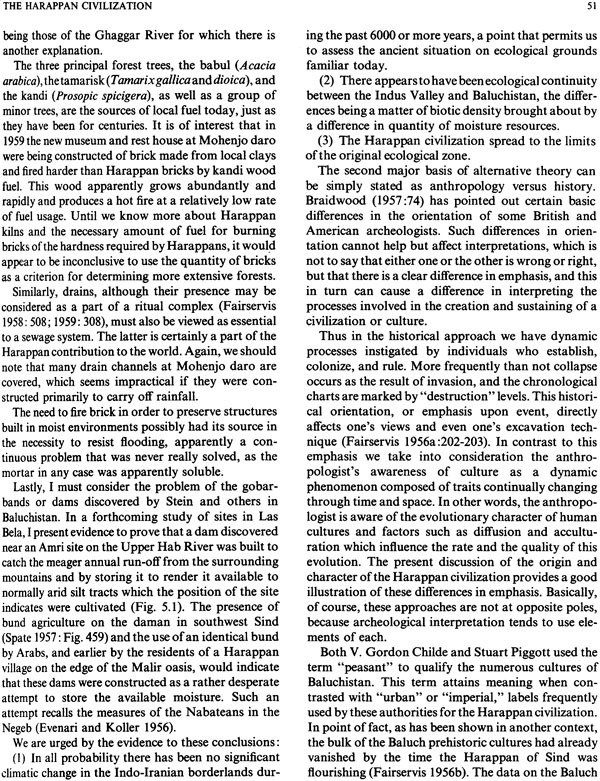 In addition to those directions for new research which seek essentially to describe, or characterize the structure and internal dynamics of South Asia's first civilization, there are a number of issues of a more purely culture-historical nature which ought to be noted in this regard as well. For example, the genesis of urbanism on the Indus plains yet to be addressed seriously in anything other than one or two studies. In the best of these, M.R. 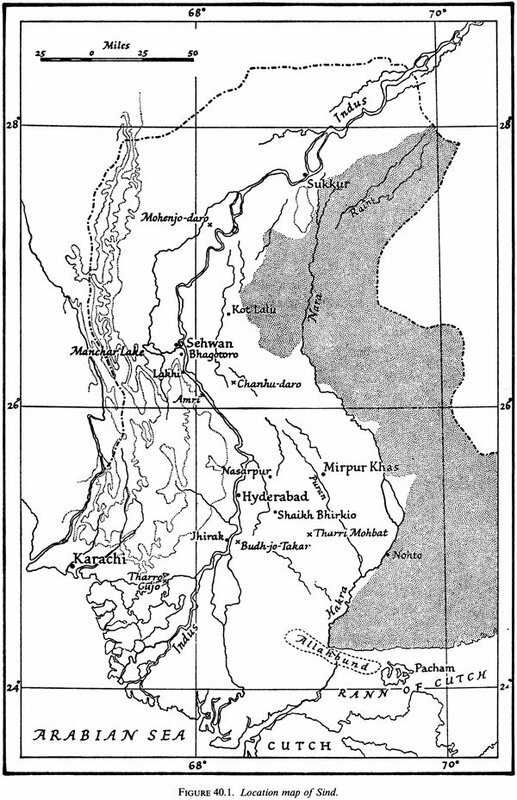 Mughal admirably systematized the comparative stratigraphy of what he has called the Greater Indus Valley and Northern Baluchistan (Mughal 1970). During the period just preceding the development of the Indus cities he isolated a ceramic complex associate with a few small finds or antiquities which forms a recurring body of material within his region. This consistent element is, however, associated with several much larger archaeological complexes which are quite identifiable and distinct one from the other. In other words, Mughal's Early complex "floats" as an island of recurring traits within a region of cultural diversity. It does, nonetheless, lend some sense of unity to the time just preceding the emergence of the Indus cities. Maghul's study is also useful in noting several features of material culture, settlement patterns and subsistence practice, which are a thread of continuity from the Pre-urban to the Mature or Urban configuration of the civilization. 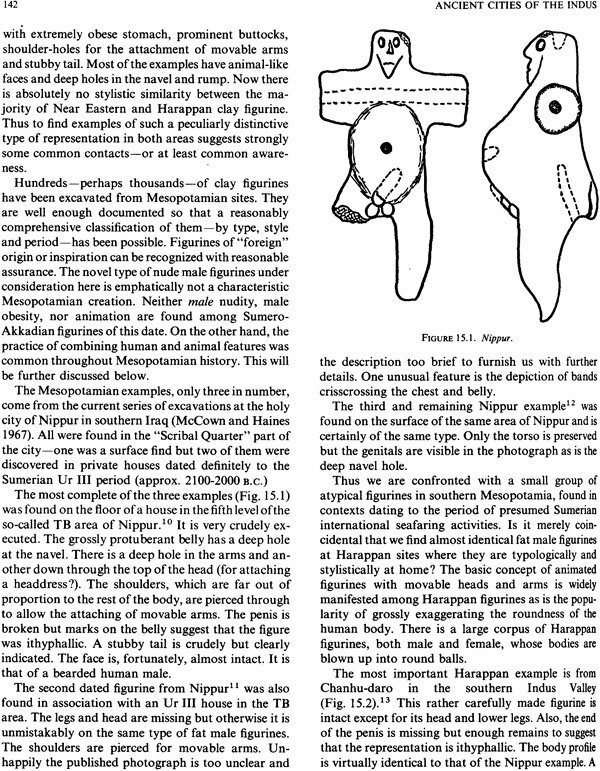 It is becoming increasingly clear that the Early Harappan is a period within which there are few signs of germinating. For example, the Indus script has no genuine antecedent there, in spite of excavation at several sites (e.g. Kot Diji, Amri, Kalibangan, Bala Kot, Jalipur and Sarai Khola). The Indus writing system seems to arrive within the Harappan cultural tradition as a fully developed feature. Yet, surely there must have been a developmental process involved with something as complex as writing. That this has not yet been found suggest that the period of transition within which the presumed development took Place was vey short, so brief that controlled excavation has yet to detect it. It should be kept in mind that the Harappan chronology is still based on radiocarbon, with check points in the Mesopotamian sequence. It then follws that the margin for errors in the isolation of a chronological boundary such as the Early/Mature Harappan must be not less than one hundred years and is probably closer to two hundred. Thus we are dealing with a poorly controlled context within which such short-term change could be easily masked or "lost." 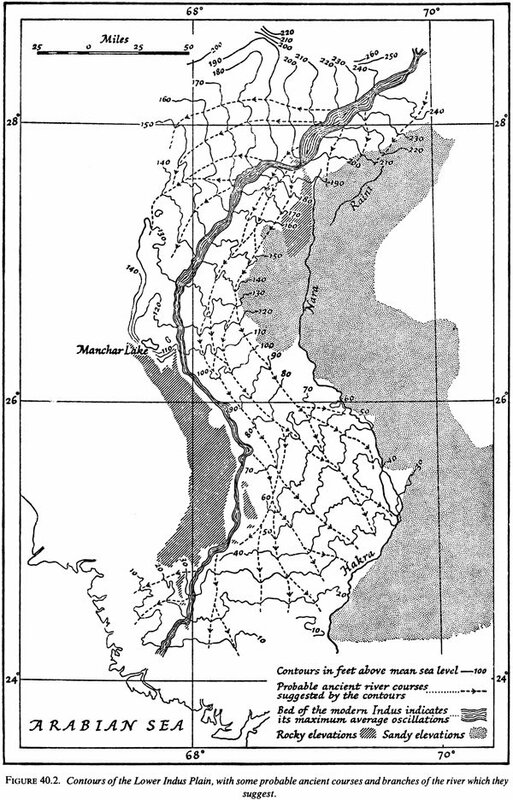 There are a number of other features in the Urban phase of the Indus Civilization for which there are no antecedents in the archaeological record. The system of weights and measures, the style of many of the metal objects, the ceramic corpus if taken as a whole, architecture features such as the use of baked brick, drains, and the diversity of building form, town planning and the distinctive, but normative, organization of settlements with a high mound to the west and a lower habitation mound to the east, the development of a settlement hierarchy-all come to mind as striking features in this regard. Thus, in the Indus case it seems that there was a brief, critical period during the urbanization process within which these and other features developed. This short period of intense change place the Indus Civilization in some contrast to Mesopotamia. In the latter case there is a much clearer long-term developmental sequence for at least the direct archaeological traits attendant upon urbanization. A gradualist evolutionary model seems to be a satisfactory perspective there. It does not seem to be as satisfactory for ancient India. There are other processally oriented questions which still adequate exposition within the Harappan Civilization. The ultimate abandonment of Mohenjo daro, Harappa and a number of other settlements is one such question which will be discussed in a moment. But first a word on the Indus "monolith." The earliest investigators of the Indus Civilization, from Sir John Marshall to Sir Mortimer Wheeler, often remarked upon seeming homogeneity of these remains. 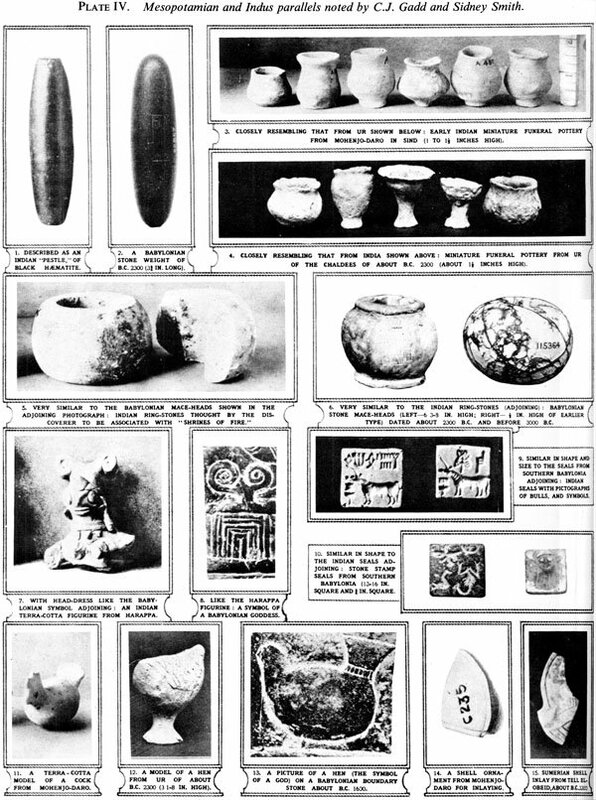 Harappan material culture was seen as virtually unchanging over five hundred years. So, too, on the spatial dimension did they note a homogeneity, in spite of the distances between sites. Mohenjo daro one another. The large Harappa site of Sutkagen dor near the Arabian Sea on the Iranian border is 680 miles from Lothal, just north of the Gulf of Cambay of Cambay in Gujarat. From latter site to Rupar in the foothills of the Himalayas the straight line distance is approximately the same: 720 miles. 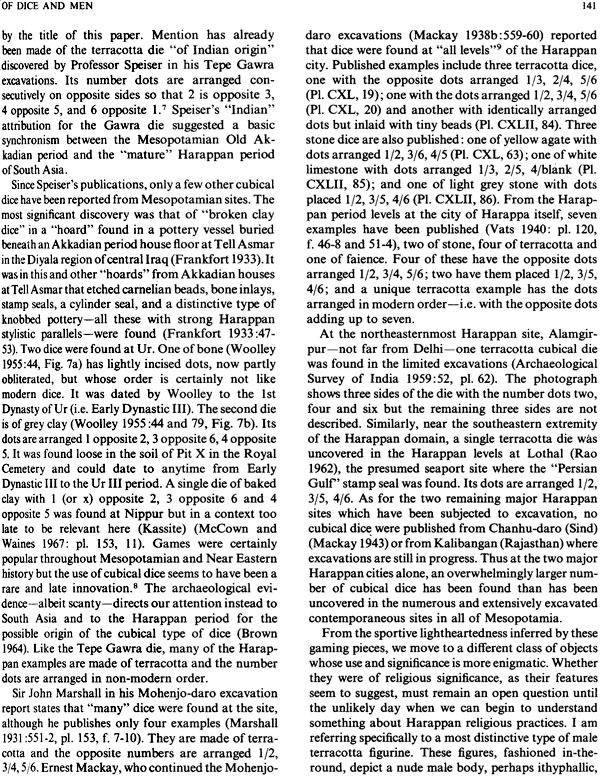 There are even recently discovered Harappan sites in northern Afghaistan near Shortigai (Lyonnet 1977). The actual area encompassed by this civilization is difficult to compute since precise boundaries are not known, but even conservatively the size is three or four times the area of ancient Sumer. This is a vast area, and five hundred years is harldy a trivial period. From my perspective as an anthropologist it seems unlikely that the monolithic, or changeless quality, or these remains is even an approximation of reality. 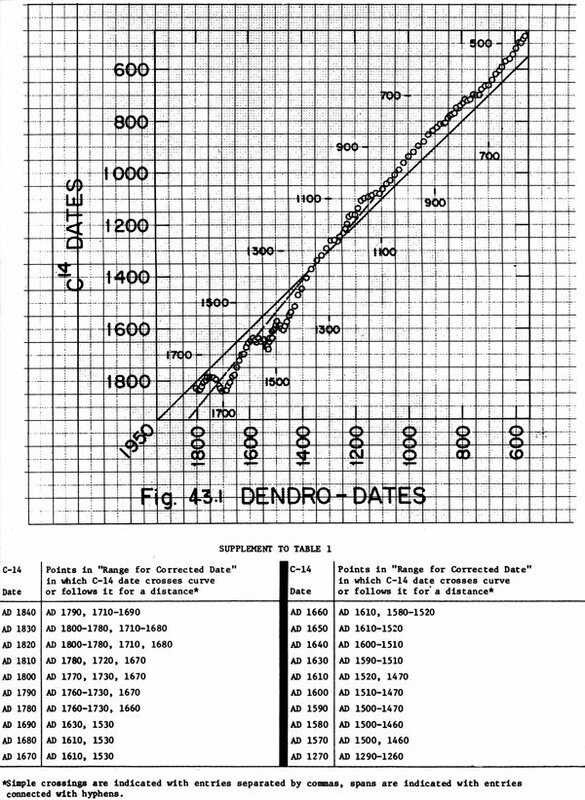 There have been at least two extensive studies which have attemoted to deal with this problem (Possehl 1974 and Fentress 1976). 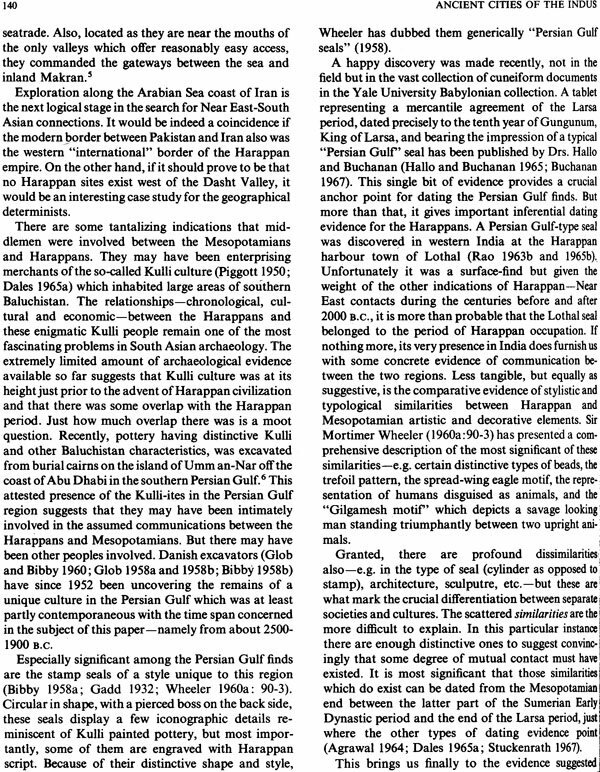 Their success indicates hat similar work on different cultural dimensions would be equally productive in defining variability within the spatial temporal dimensions of the Harappan civilization. The so-called "end" of the Indus Civilization has been discussed at some length in the Introduction to part IX. But since the focus here is more clearly programmatic a few additional words on the topic may not be redundant. The first point to be emphasized is that the problem seems not to be best stated as the "end" of a civilization; at least in the sense of a tradition, since here are abundant signs of cultural continuity in Sind, Gujarat, the Punjab and adjacent areas of North India (Pssehl 1977). But the cities, Mohenjo daro and Harappa, were abandoned along with other places (e.g. Kalibangan, and Jadeirjo daro) which seem to have been towns. Many smaller sites have discontinuous occupation as well. This phenomenon is however not applicable to all Harappan settlements. For example, Chanhu daro and Rangpur have very clearly defined Post-urban occupations. Moreover, the process of abandonment, at least at Mohenjo daro and Harappa, took a considerable period of time. This is in the range of one or two hundred years if the "squatter levels" in the uppermost reaches of these sites can be used as a chronological guide. The pattern of change, the, seems not to indicate an end to this cultural tradition as much as a progressive modification if the distinctly urban form, a shift in the level of sociocultural integration. There is in addition to the shifts in settlement occupation an interesting set of typological discontinuities associated with the Post-urban Phase. The most striking of these is the system of writing which was drastically altered and preserved only as occasional graffiti on pottery. 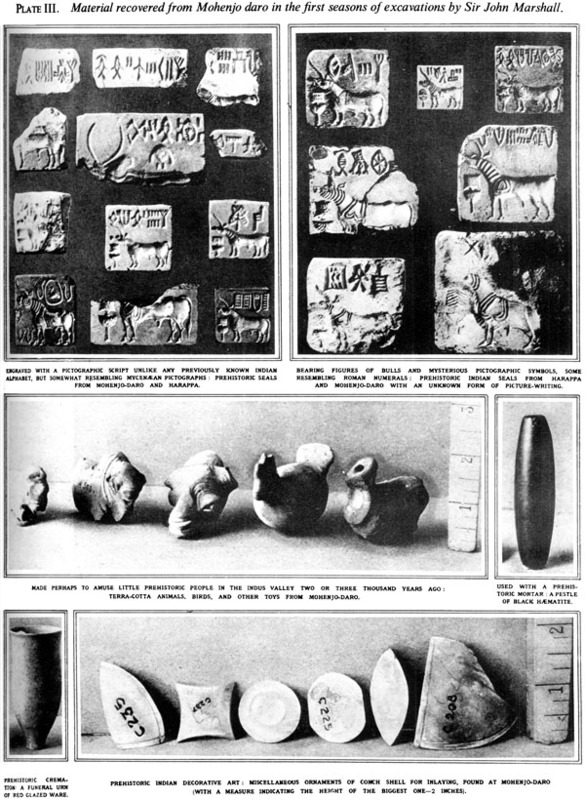 The square steatite seals are confined to the Urban Harappan. So too is the standardized system of weights and measures. The typological list can be expanded to include the pattern of worked stone, triangular terracotta cakes, metal objects, bead forms and the like. This is a genuine "mixed bag: of cultural items, some of which seem to bear more directly than others on the problem at hand. The process which eventually led to the gradual abandonment of the two cities and the other settlements, and which seems linked in some way to the typological shifts just noted, is best assumed to have been complex. Yet, what is it we are really attempting to explain? The previous sentence is, I think, a fair summary, and a telling one as well. It is a vague generality without significant detail, or historical richness which places constraints on hypothesis construction. The logic for programmatic purposes is then clear. Since it is essential to know what is to be explained before attempting to explain it, the priority must go to culture history. A range of important lacunae in our understanding of Harappan life ways, or institutional configurations, were noted in earlier paragraphs. Studies such as these, once complete, ought to yield interesting and important insights into processual issues relating to the issues relating to the Post-urban Harappan. So too might similar work on the Post-urban Phase itself be productive. 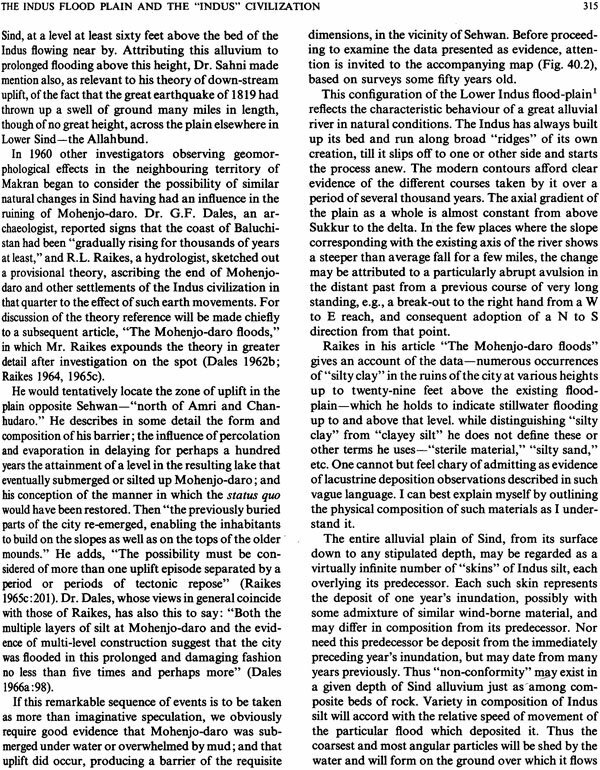 Studies such as these are essential first steps in reconstructing the aspects of Harappan culture history which have a direct bearing on what we perceive today as the abandonment of Mohenjo daro and Harappa. At the expense of seeming to be redundant let me restate the case slightly. The process which eventually led to the development of the Post-urban Phase of the Indus Tradition is not one with constraints on data which are sufficiently robust for us to confidently define the problem. The task for archaeology is then to do the kind of research which will ultimately correct this situation. Character studies, essentially the investigation of life ways, seem to be a direct route to this goal, especially if the Urban and Post-urban Phases can be contrasted in these respects so that we will develop a more encompassing sense of just what did change in the culture history of the Indus Civilization. The foregoing is certainly not intended to be a comprehensive summary of every pressing, or worth while direction for research narrowly defined statements for work action by those who are actually involved in work on things Harappan. They are instead to act as a guide for those who will use this book. It is hoped that they will place the papers which follow in some kind of his torical perspective where the result of past scholarship can be seen as contributing to the evolving configuration of this field of study. The book has been organized into eleven pars, each covering a separate aspect of the Indus Civilization. 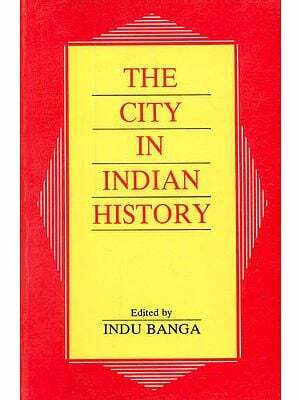 Some topics which might have Indus added, the genesis of urbanism for example, could not be highlighted in this way due to an insufficient body of appropriate material. In other subject areas it was impossible to include everything of value. This meant that at times considerable selectivity has to be exercised. In these situations newer paper were given a priority over older ones, and a concise statement, especially if it covered several facets of the civilization, was given prefence over more lengthy treatment. If this selectivity has perhaps caused something important to be omitted, or the thought of a prominent spokesman to be slighted, I can only offer an apology and note that every effort was made to achieve representative coverage within a context where comprehensiveness was impossible. There is a degree of arbitrariness in the composition of individual parts. This is due to the fact that the best papers in any discipline probably have more than a single important aspect and it is therefore impossible to satisfactorily place them within an essentially static structure such as a table of contents. The composition of parts is thus largely a reflection of my view of this civilization. Each part has been prefaced by a short introductory essay. These are intended to highlight the contents, place the material within some larger context and offer additional bibliography which will useful in pursuing individual problems at greater length. The preparation of this book required certain decisions concerning content and format. The major alteration of the original material has been the adoption of a single system of citation. 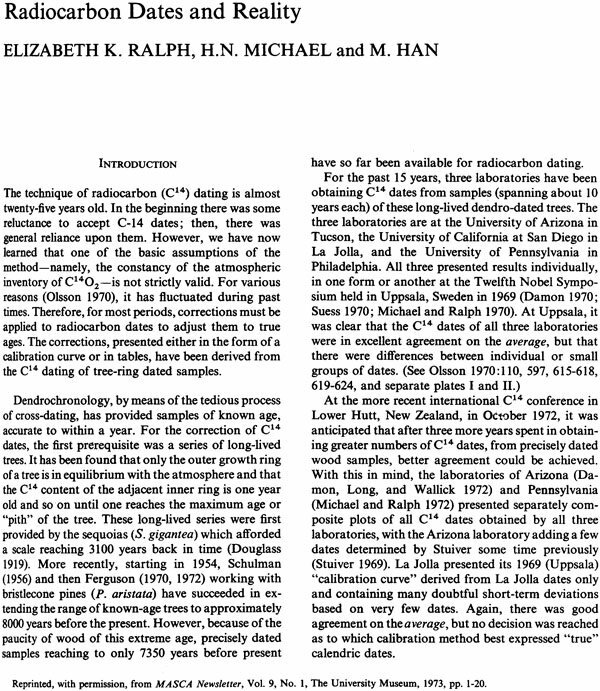 A good deal of bibliographic research was required to complete many of the older style footnotes; however, the system used here should enhance the readability of the text and allowed the book to be organized around a single bibliography. 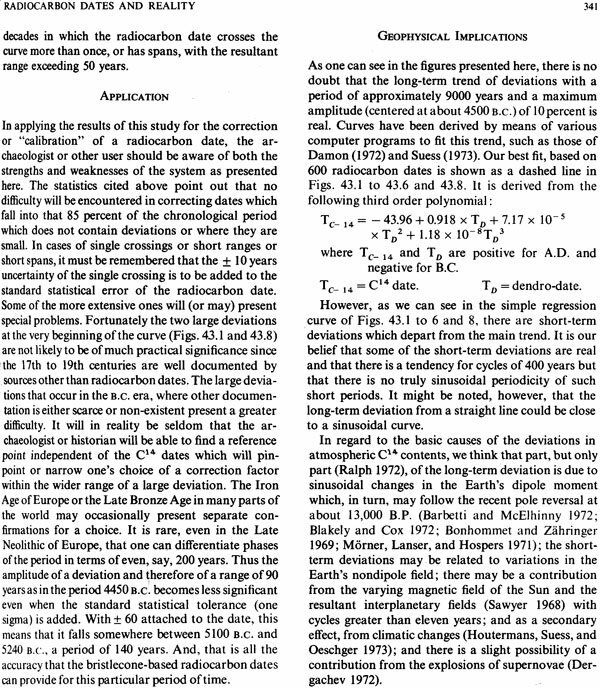 At times the text of individual paper was slightly altered. For example, the specialized transliteration were omitted from Oppengeim (1954) wherever possible. In addition, many illustrations, especially photographs, were deleted as an essential cost-saving device. The reader with note, however, that the book is still rich in illustrative materials. This is not, in fact, my book. It is the product of the individual scholars whose original research has been compiled here. It is to them, and to their publishers, who generously gave the right to reprint the papers, that the credit must go. Others who played a role in the Preparation of this manuscript are: Jennifer Quick, Margaret Pugh, Patricia Canfield and Lisa Quigley. I would like to thank all of them.